Amorino Gelato. Every year prior to July, National Ice Cream Month, we look for a great new brand of ice cream to review. This year, we were not disappointed: Amorino Gelato, the acclaimed European gelato and coffee chain, has come to the U.S. The gelato and sorbetto—celestial, awesome, fill in your favorite superlative here—is our new favorite ice cream and sorbet. Everything is as good as it can be (our thought: “to die for”), sometimes jaw-droppingly so (don’t overlook the Chocolate Sorbetto—no dairy—is like thick fudge, the Basil-Lime special of the month is a revelation, etc. etc. etc.). Launched in 2002 in Paris by two friends, the the company now has some 60 locations worldwide, and growing. There are two locations in Manhattan (Eighth Avenue and Eighteenth Street in Chelsea and University Place in Greenwich Village), one in Boston on Newbury Street, and others to come (keep checking the website or the Facebook page for new locations). 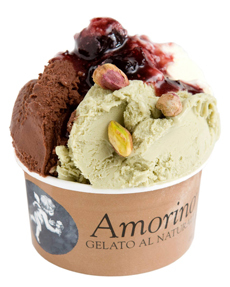 Want an Amorino Gelato in your home town? Franchises are available. All of the food is made by artisans in Italy and shipped to the U.S. 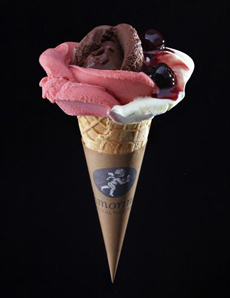 The brand’s signature is the gelato “flower” (photo above), with petal-like scoops. You can have as many different flavors as you want, from the monthly selection of 23 flavors (gelato, sorbetto, frozen yogurt) plus a special of the month. If you are traveling to an “Amorino city,” make it a destination. You won’t be disappointed, even if you have to wait in line. Or better yet, make your city an Amorino city! Don’t want a petal cone? Have a cup! Photo courtesy Amorino Gelato.